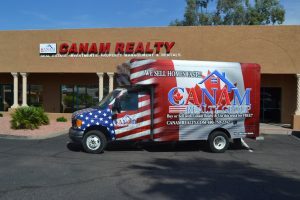 BUY OR SELL WITH US AND USE OUR TRUCK FOR FREE! Simply check the availability, choose the date you want, and submit your request. It’s that easy. Please call our office at 480-759-2242 and speak with one of our team members for scheduling. 4. Check for $100.00 – we hold this until we receive a receipt showing that the gas tank was refilled. The trucks are available for 24 hour check out periods only. They cannot be scheduled for two consecutive days. The check out/in periods run from 9 am to 9 am the next morning. USE OF THE TRUCK IS LIMITED TO Maricopa COUNTY and the City of Maricopa. Use is available to current CANAM clients only. Must have Valid Driver’s License & Insurance.